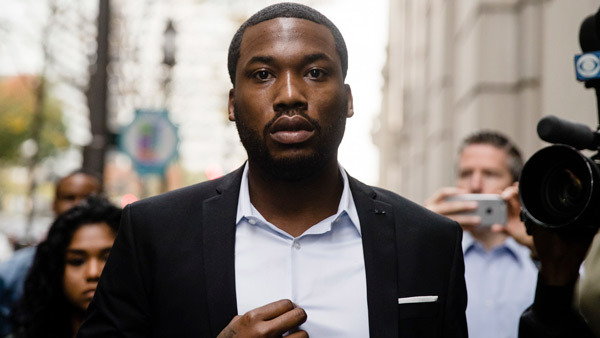 PHILADELPHIA -- Meek Mill's legal team is again asking an appeals court to free him from prison. Lawyers for the rapper filed their appeal with Pennsylvania's Superior Court on Monday, the same day that the Philadelphia judge who jailed Mill denied to release him and called him a "danger to the community." The 30-year-old rapper was sentenced to two to four years in prison last month for violating probation on a roughly decade-old gun and drug case. His lawyers unsuccessfully appealed to the higher court last week and have also called for the judge to step aside because "there was an FBI investigation" into her conduct and Mill's case. The FBI says it does not confirm or deny investigations. The judge has had no comment. Meek Mill sentenced to prison. Tamala Edwards reports during Action News at 5 a.m. on November 7, 2017. Judge: Meek Mill is a "danger to the community"